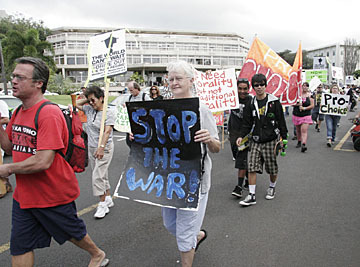 Several organizations held a rally yesterday at the University of Hawaii-Manoa campus to protest the Bush administration and its Iraq war policies. Two students agreed with protesters' opposition to President Bush at the University of Hawaii yesterday but differed on whether the war in Iraq should continue. "I agree with what they stand for, absolutely," said Jennifer LaFever, 23, majoring in fashion design. She added that she does not support the president, but does support the troops, noting that she has a brother, Sgt. Charlie LaFever, in the Army. "I don't believe we should have gone to war, but I do believe we have to finish the job," LaFever said. UH student David Kalohi said he supports Bush's decision to go to war but hopes it ends soon. "There are people dying, but not to the extent as any other war," he said. But Kalohi added, "It's just taking too long." About 50 people marched around with signs and large banners shouting, "The world can't wait. Drive out the Bush regime." Members representing several organizations such as Not in Our Name-Hawaii, the World Can't Wait Movement and Iraq Veterans Against War called for Bush's ouster and an end to the Iraq war yesterday on the anniversary of Bush's re-election. Protesters lay under white cloth splattered with red coloring at the end of the march. Students heard clanging sounds throughout the campus as protesters struck pots with sticks and their hands against bongo drums and large water bottles as they marched from Hamilton Library to the UH-Manoa Sustainability Courtyard yesterday morning. 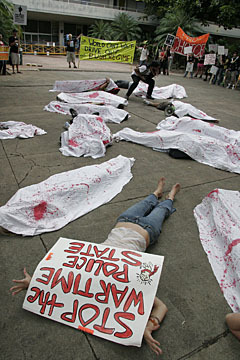 At the sustainability courtyard, some participants spoke during a "die-in" demonstration where a dozen protesters lay in the middle of the courtyard covered in white sheets that were splattered with red paint to depict the bloodshed of the estimated 2,000 American soldiers and 100,000 Iraqi civilians killed in the war. "Our silence and paralysis in not acceptable," said Mark Pascua, 21, of the World Can't Wait Movement. President Bush is leading the nation toward the direction of fascism, and it must be stopped, Pascua, a Kapiolani Community College student, said. Some protesters also held signs supporting women's rights. "Those of us against them (Bush administration) has to step up," said Anne Alves, of the Radical Cheerleaders of Hawaii, an alternative group, holding a banner that read, "Pro-Choice." Alves, 22, of Leeward Community College, said she does not know if she completely agrees with abortion, but believes in the woman's right to choose. It is not the government's decision, she said. "They can't run our daily lives." The rally continued later in the day at King and Bishop streets and wound up in front of the Army and Marine recruiting centers on Kapiolani Boulevard near Piikoi Street, where protesters held signs that said, "Impeach Bush" and "Stop torture."